Migrating a VBA Solution to a Visual Studio Tools for Office Add-In Learn how to use Microsoft Visual Studio 2005 Tools for the 2007 Microsoft Office System to add new functionality to your Visual Basic for Applications (VBA) solutions, using the VBA skills you already have. 2007 Office System Developer Posters Download these posters to learn more about the new features and enhancements in Office 2007. Office Accounting 2007 Software Development Kit (SDK) Includes documentation and samples—everything developers need to write, build, and deploy Microsoft Office Accounting integrated applications. Office Accounting 2007 Update: Microsoft Office Accounting 2007 Transaction Migration This download provides the update to Microsoft Office Accounting 2007 to enable import of transactions from Intuit QuickBooks. I am now using IE7, but disappointed that there is still no minimize to the TaskBar IconTray functionality, and I can't find an add-on. So I built my own applet to reduce screen clutter and re-launch IE instantly after hiding it. IE is not open. Double-clicking the icon will launch IE. IE windows are open and visible. Double-clicking the icon will hide all IE windows. All IE windows are hidden. Double-clicking the icon will restore all IE windows. A global hot key [Win+i] saves you double-clicking the tray icon anywhere in Windows. Left-click on the tray icon to use the popup menu, and set an alternate global hot key. Improving Performance in Excel 2007 Learn about the increased worksheet capacity in Microsoft Office Excel 2007 and techniques to improve calculation performance. Download: Office SharePoint Server 2007 SDK: B2TR The Microsoft Office SharePoint Server 2007 (Beta) SDK contains conceptual overviews, programming tasks, code samples, and references to guide you in developing solutions based on Microsoft Office SharePoint Server 2007. Integrating Visio 2007 and Project 2007 Take advantage of the new integration capabilities in Project 2007 and Visio 2007 by using a combination of native features and COM add-in features. Video: Building Documents from Scratch Using the Office XML File Formats Demo of the Open XML formats, including the key things that go into building a document. Integrating Visio 2007 and Excel 2007 See an example of linking data in Visio to Excel by using the Visio Data Selector and an example of creating and populating an Excel Bill of Materials by using Automation code. The objective of the SQL Server Hosting Toolkit is to enable a great experience around hosted SQL Server. The Database Publishing Wizard works toward this mission by making it easy to upload a database from a development box up to a shared hoster. In its first incarnation, the Database Publishing Wizard is a command line tool that generates a T-SQL script designed to be executed in the script execution windows provided by most hosters in their database management consoles. In the coming months we'll be adding a GUI and building seamless integration between the tool and an upload service we'll provide to hosters for deployment. We plan to be releasing advances in the Toolkit frequently so check out this first CTP and give us your feedback! 922328 Office 2003 icons appear fuzzy or have poor contrast after you change the DPI setting in Windows to "Large size (120 DPI)"
Building Ad-hoc Reporting Solutions with SQL Server 2005 Report Builder and Analysis Services OLAP This paper introduces Microsoft SQL Server 2005 Report Builder and demonstrates how to build an end-to-end ad-hoc reporting solution for enterprise customers using Report Builder and Microsoft SQL Server 2005 Analysis Services OLAP. Get More Out of SQL Server Reporting Services Charts Review general information, best practices, and tips for designing charts within Microsoft SQL Server Reporting Services reports. Download: Windows SharePoint Services SDK Conceptual overviews, programming tasks, samples, and references to guide you in developing solutions based on Microsoft Windows SharePoint Services 3.0. Download: Office Project 2007 SDK: B2TR Documentation, code samples, How to articles, and programming references to help customize and integrate the Project 2007 clients and Project Server 2007 with other Office applications. 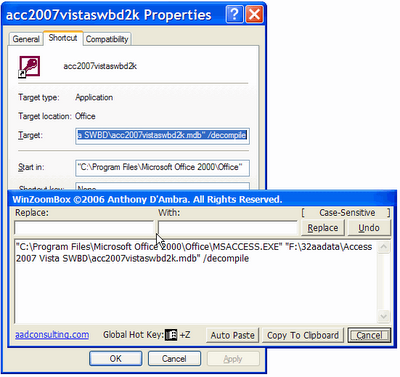 2007 Office System Document: Lists of Control IDs (Beta 2 TR) Download containing files that list the control IDs for built-in controls in all applications that use the Office 2007 Ribbon. Building Better Business Applications Using 2007 Office System MS Office 2007provides a set of servers, clients, and tools to make it easier for enterprises and software vendors to build and deploy OBAs to connect current LOB systems with the people who use them through the Microsoft Office interface. 10 tricks for handling null values in Microsoft Access Null values indicate that data is missing or unknown, and if not handled correctly can cause runtime errors or corrupt your data. These pointers for MS Access from TechRepublic.com will help you understand and effectively address null values in various situations. Integrating MS Office Applications with ASP.NET 2.0 Web Sites Integrate Microsoft Office Word 2003 and Microsoft Office Excel 2003 with ASP.NET 2.0 Web sites to generate form letters in Word and graphical reports in Excel. 2007 Office System Document: Understanding Workflow in Microsoft Windows SharePoint Services and the 2007 Microsoft Office System In this white paper, learn the basics of the Windows Workflow Foundation, how this technology has been integrated into both Windows SharePoint Services and the 2007 Office System, and how to benefit from workflows applied to business processes. SQL Server Database Publishing Wizard CTP 1 The SQL Server Database Publishing Wizard provides a way to publish databases to T-SQL scripts for later use. The Wizard enables the deployment of SQL Server 2005 databases into a hosted environment on either a SQL Server 2000 or 2005 server. It generates a single SQL script file which can be used to recreate a database - both schema and data - in a shared hosting environment where the only connectivity to a server is through a web-based control panel with a script execution window. Business Contact Manager for Outlook 2007 Developer Guide Microsoft Office Outlook 2007 with Business Contact Manager combines the familiar appearance of Outlook with customer information management to help small business owners track customers and sales opportunities more effectively. Integrating Office Applications with ASP.NET 2.0 Web Sites Read about how one MVP integrates Microsoft Office Word 2003 and Microsoft Office Excel 2003 with ASP.NET 2.0 Web sites to generate form letters in Word and graphical reports in Excel. Developing Add-ins (XLLs) in Excel 2007 Learn about Microsoft Office Excel 2007 features that affect XLL add-ins and enable new XLL functionality, as well as changes to the XLL C API itself. Migrating a Shared Add-in to a Visual Studio Tools for Office Add-In Read this article to learn about issues you might have with existing shared add-ins. Learn how to migrate add-ins to Microsoft Visual Studio 2005 Tools for the 2007 Microsoft Office System and how to convert command-bar code to support the new Ribbon. Working with Content Controls in Word 2007 View this screencast to walk through using content controls in Word 2007. Integrating Visio 2007 and Excel 2007 Visio 2007 and Excel 2007 provide built-in integration capabilities. See an example of linking data in Visio to Excel by using the Visio Data Selector and an example of creating and populating an Excel Bill of Materials by using Automation code. Creating Custom Task Panes Using Visual Studio 2005 Tools for Office The 2007 release of Office introduces enhanced custom task panes that you can use to provide contextual assistance to your users. Learn how to create custom task panes with Microsoft Visual Studio 2005 Tools for the 2007 Microsoft Office System. 2007 Office System Document: Working Together in the New World of Work In this white paper, explore the Microsoft communication and collaboration platform and see how it offers a flexible solution set to businesses of all types. Test the SQL Server Business Rule Chaining Method Chaining database stored procedures to execute business logic in your SQL Server database. This article from TechRepublic.com explains the concept of business rule chaining, and provides an implementation example. 2007 Office System Video: Client Development Download this series of developer-oriented videos to view conference breakout sessions about using the Microsoft Office System client. Using Visual Studio 2005 to Perform Load Testing on a SQL Server 2005 Reporting Services Report Server Visual Studio 2005 Team System includes a load-test tool you can use for performance and stress testing of a SQL Server 2005 Reporting Services deployment. The tool runs the tests you create, and optionally logs the data into a SQL Server 2005 database. Designing and Delivering Rich Office Reports with SQL Server Reporting Services 2005 and SoftArtisans OfficeWriter Use SQL Server Reporting Services 2005 and SoftArtisans OfficeWriter to design and deliver full fidelity, data-driven Microsoft Excel and Word reports. Google Code Search gives software developers a tool for searching billions of lines of on-line source code. Office 2007 System: Enterprise Content Management Download this series of developer-oriented videos to view conference breakout sessions about the new, extensible content management features in Offcie 2007. Accessing SQL Server 2005 Databases with PHP Improve your Web development by configuring the PHP extension with SQL Server 2005 Express Edition databases. Download this series of developer-oriented videos to view conference breakout sessions about using the Microsoft Office System client. WinZoomBox v1.1 Freeware 4-Oct-2006 ©2006 Anthony D'Ambra. All rights reserved. To overcome my frustrations when editing Windows Shortcut properties, I have developed a new free system applet: WinZoomBox.